When it comes to laundry, I love to have my laundry turn out soft and smelling nice. I guess it is because I grew up in a house where my mom didn't use softener so we had scratchy towels, washcloths and sheets. It was all I knew and until I began to use softening products on my own laundry, I didn't know what I was missing. My laundry has begun to smell REALLY great recently, and I am going to share my secret with you all today! 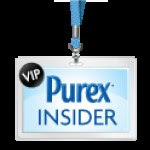 I have recently become an insider with Purex, meaning that I get to test and review sample products from Purex...which is SO exciting! So, this review is part of my role as a Purex Insider and I hope you enjoy! Using laundry softener has been a new journey for me. I have always been on the hunt for products that make my laundry smell, look and feel better, while providing me with convenience and ease when it comes to using them. Purex Complete Crystals Softener is a brand new product that has only been on the market since December 28, 2010. I had never heard of this new product until just recently when I saw it explode onto the blogging scene. I won my first bottle several weeks ago and was so incredibly thrilled with it, I just knew that I needed to share it with all of you. For this review, I was sent a sample bottle of Purex Complete Crystals Softener in the Fresh Spring Waters scent. This product is VERY different from other traditional fabric softeners in that it is in crystal form. I LOVE this because it means less spills and mess to clean up. The crystals are also very strongly scented so you don't need much to get your laundry smelling really great! ~Purex Complete Crystals are added at the beginning of the wash cycle, when the machine is filling with water. The other softener had to be added at the last rinse cycle. I don't know about you, but I just can't remember...nor do I have time to run to my basement to add softener at the last rinse cycle! ~Purex Complete Crystals are 92% natural...not oil-based like other liquid fabric softeners. So, instead of coating your fabrics with oil, these crystals penetrate the fabric and infuse with freshness for weeks! The other softener is oil-based which makes your laundry feel heavy and damp. ~Purex Complete Crystals keep your towels soft and absorbent. I researched a bit and found that this other leading fabric softener company said this about their softener: "It's true that_____makes towels less absorbent. When_____is infused into fabrics, it reduces their ability to absorb to a small degree. However, this difference on absorbency is subtle when compared to the experience you get when drying off with a soft, fresh towel just washed in____." No thanks...I will stick with a softener that can KEEP my towels soft and absorbent! ~Purex Complete Crystals are 100% safe to use on children's clothing. They do not impair flame retardant qualities that are found in my kid's clothes. Other leading softeners impair this flame retardant quality by coating the clothes with oil. YIKES! 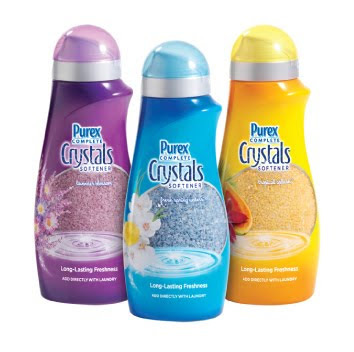 Purex Complete Crystals come in three scents: Fresh Spring Waters, Lavender Blossom and Tropical Splash. I haven't tried the Lavender Blossom or the Tropical Splash as I am currently in love with the Fresh Spring Waters...but will definitely be trying them sometime soon! So, in my opinion..Purex Complete Crystals are the BEST. I have not found a better softener that really works this well for me and I am thrilled with the results! The scent is amazing and one bottle lasts a long time! YOU can win a coupon for a free, full-sized bottle of Purex Complete Crystals from me! Just complete these easy entry options...there will be three winners!!! Visit Purex and tell me which scent you would love to try. You do not have to be a blogger to enter, but you must have a valid email where you can be reached should you win. If you do not leave an email address, it must be where I can easily find it. This giveaway is open to US residents and will end 3/17 at 11:59 pm EST. The winner will be chosen using random.org and will be notified by email. The winner will have 48 hours to respond, or another winner will be selected. 8. Add my button to your blog. Leave a link and let me know where to find it. 5 entries, so 5 comments. 9. Click THIS LINK to Purex. 1 entry, can be done daily! Disclaimer: I received no monetary compensation for this post. I did receive Purex Complete Crystals for review purposes as part of being a Purex Insider. All quotes are from the Purex website and email. All thoughts and opinions are mine. I'd love to try Tropical Splash. Fresh Spring waters, also the lavender looks like it would smell good also. I would like to try Tropical Splash! I would love to try the Tropical Splash! I would love to try the Tropical Splash scent! This product sounds like something I could get used to :) I am always forgetting to put the softener into the final rinse. i'd love to try the lavender blossom! thanks for hosting another nice giveaway! The spring waters scent sounds nice! I would love to try lavender blossom scent sounds nice! Great giveaway thank you so much. I would love to try the Lavender. Thank you for the lovely giveaway. I clicked the link to Purex. I clicked your Purex link today. I like Purex over on Facebook. Fresh Spring Waters is my favorite scent!